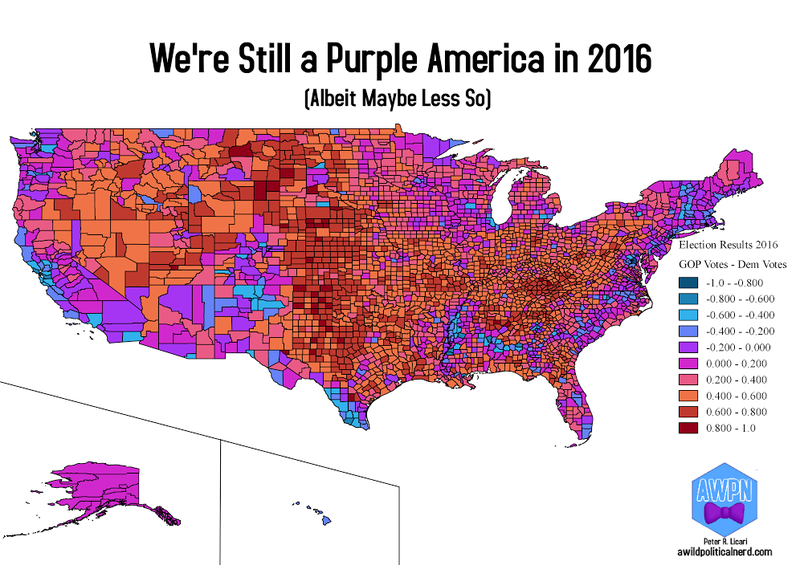 So I recently came across this map made by Robert J. Vanderbei from Princeton showing a "Purple America" in the aftermath of the 2012 vote. I've seen it a few times over the years and it has been consistently used as an example of how surprisingly "moderate" American presidential politics are. We all know that there are "red" states and "blue" states; consistently Republican and consistently Democratic. Well, we don't all know this. 6 year old Peter was pretty convinced that all of the discussion about states being one color or another meant that they were colored that way. Not on the surface, of course-- but maybe, like, in the dirt or something. Point being, Peter wasn't a very bright child. Martians tend to be pretty conservative, as fans of Futurama will tell you. But we also don't all know this either because, as the map shows, it's objectively false1. And, without stepping on too many Epistemologists' toes, you can't know something that isn't true. Many states that are conceived as being solidly Republican (e.g., Texas) contain blue counties while others that are "staunchly" Democratic (e.g., New York) contain a couple of red splotches, here and there. And, throughout the map, you just find a whole lot of purple. 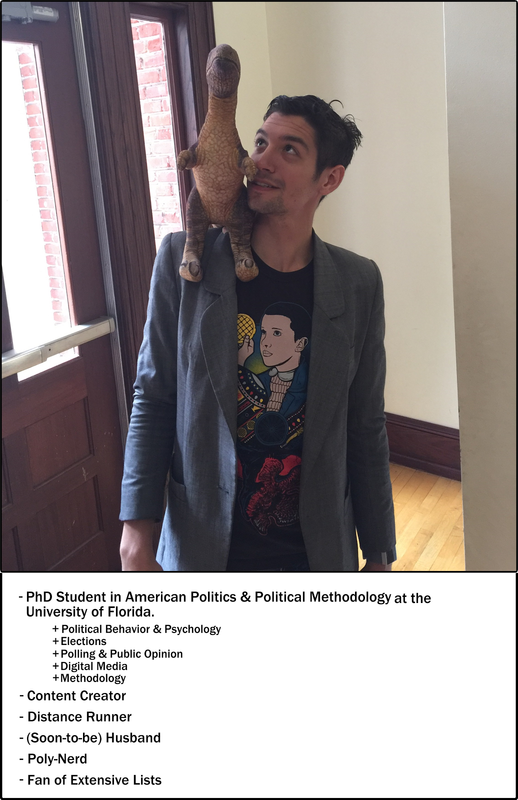 The idea that most American's are actually moderate is pretty prevalent in studies of American Political Behavior. Indeed, even at our most ideologically polarized, we still can find a lot of common ground between the tenets of the left and right-- even if there's substantial disagreement on implementation. People tend to be moderate (or even ambivalent) in most of their political beliefs with only the most engaged actually giving enough of a damn to be polarized or ideologically consistent. Even with how nasty, brutish, and divisive this election was, there's little reason to believe that 2016 changed these core facts. But the virulent electoral idiosyncrasies of 2016 invites an interesting question. Are we still as purple as we were back in 2012 2? 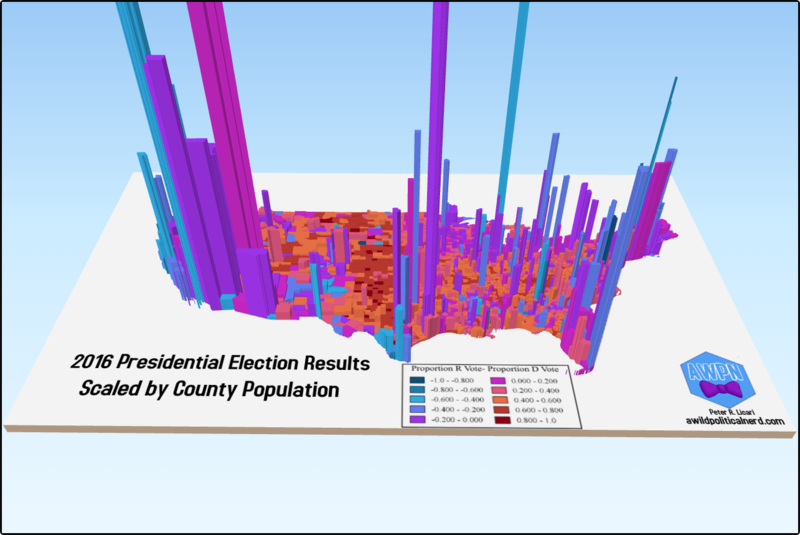 I used recently available county-level election results from github user tonmcg and QGIS to visualize the election results. Here's another quick thing: Although Vanderbei's map is pretty popular, he produced another one that shows how strongly correlated population is with the "blueness" of a county. Obviously there are some exceptions (looking at you, Alabama) but the highly populated areas tended to go either blue or violet. I'm not entirely sure why this map didn't take off-- especially considering the hoopla about the electoral college. Maybe I'm a bit biased; I'm a sucker for solid 3d visualizations. Regardless, I decided to continue that idea into 2016. There's a snapshot of the results bellow and you can download the link to the html file here. What's interesting is that the highly populated counties are not as blue as they were back in 2012. Sure, the majority were blue but a visible plurality were purple. There's also a couple of red areas peaking out (such as northern Florida) that did not appear as prevalent in Vanderbei's projection. I'm a little cautious to say that we were seeing more democratic defection in the large cities than in 2012 since there could be differences in the color scale and in the scales used to demonstrate county population. However, it is possible that these areas were not as solidly blue as they were four years ago. Although there hasn't been much change on the map, there still appears to be some. And we would be remiss in averring those differences to be trivial. Only time will tell if this increase in polarization will continue to intensify. And, if it does, whether it will start to transude into the ideas and beliefs of Americans as opposed to merely manifesting itself in their electoral behaviors. 1 We're not even talking about a historical perspective either where the South was Democratically controlled from reconstruction through the 1960's.